Irish Gardeners Forum Home -> Alpines and rockery perennial plants ... Your rockery in Ireland. If you are feeling adventurous then try collecting seeds from alpines to grow in your own garden. Some of the seeds need nature to take care of them so put them in a pot, label them and put them in a sheltered spot away from slugs. Some might germinate quickly but others need a frosting before they appear. Alpine plants are one of the easiest plants to grow from cuttings. If you see any plants you like the look of then cut off a couple of small pieces of stem with a node on it and push it into compost. Be careful if you try this in garden centres or parks as you could get arrested for stealing. Stick to friends' gardens! You wouldn't believe how many people we stop from taking cuttings from plants in the garden centre! Which are the alpines which grown wild in Ireland? I have sedums but they are from a nursery. Is heather considered alpine? Do I take the whole plant or does it grow quickly from seed? Can you tell me which plants are 10 on a scale of easy just as sedum is a 10 for no fail will grow anywhere. Thanks. Here's a plant that I did have but disappeared so I will try again from seed, called the pasque flower. Does anyone have them and how do you get them to renew? I think the foliage maybe dies back after flowering and I probably inadvertently plowed over it or the periwinkle smothered it. I had a Cypress fall during the storms and it demolished a wall in the process, rather than rebuild the wall I am thinking of making a rockery with the stones. 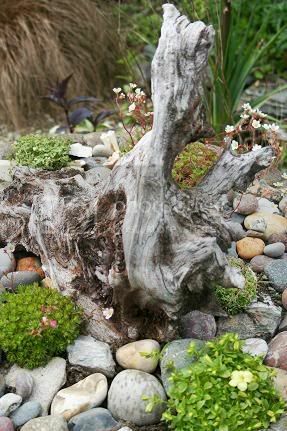 With the tree down there is a lot more light and some of the stones are too heavy for me to rebuild with, I have a rockery in another part of the garden with Alyssum, Dianthus 'Evening Star' and another that sounded like Obrichia but I cannot find that name when I Google it. Anyway I presume this time of year would be a good time to split some of the existing plants and relocate them? I was just aiming to fill gaps with potting mix and transplant them, is there anything I should be aware of? Sedum is great to put into an old rockery wall which I have in the back. It can just be plugged in can grow on a vertical. Foilage is interesting in itself but the flowers no big attraction so am putting in some morning glory seeds to drape and wind about. Rambling roses are appear in the roadside hedges and they're great for snipping and planting for the roaming look. Progress is slow in my hillside reclamation project. My hands are deteriorating faster than the square footage of new rock or growing space. The peat is tough to break up what with the mature gorse roots and matted grass. The best tool is a pick axe but I'm only good for a few swipes before it's too hard to continue. Instead, a stainless steel foot long knife I bought at a charity has been the easiest to use alongside a radio playing the talk show to keep company. Alpines at Lidl are a good price at 4 euro for 4. They need a drier soil and will rot in the boggy patches so a sand and stone addition will have to be amended. Aubrietta seeds Bells of Ireland sprinkled to see what takes. Roses were great value at Lidl for 2.99. I was told that some were excellent named varieties that would cost 14 euro elsewhere. I think you will find that is Aubretia robineire. The pasque flower is growing in the middle distance of the pic, about a foot high. I had some, once, and it was lovey, with really good seed heads. It lasted a few seasons and disappeared. I should probably have divided it. Thanks tagwex my plant identification talents are zero anyway I read through the rockery section on here and wont make the mistake of using too rich soil on my rockery and keeping the stones running the same way makes a lot of sense too.